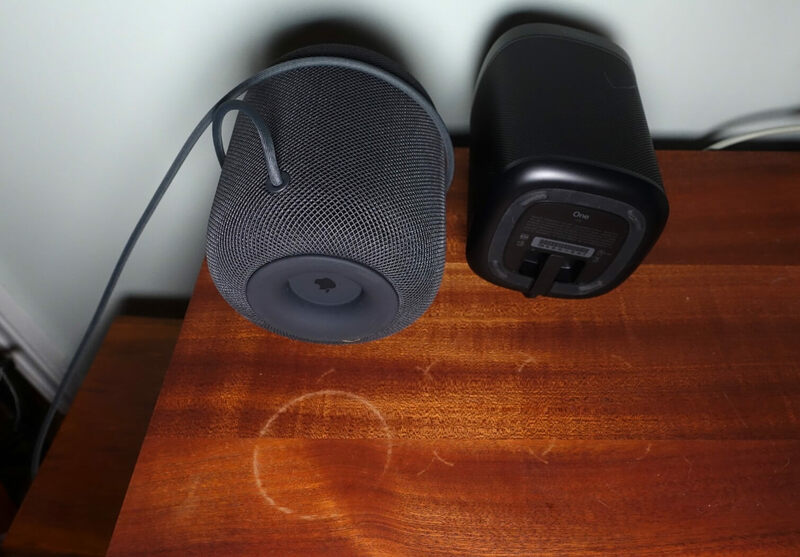 After yesterday admitting that its $349 HomePod smart speaker could leave white rings on certain surfaces, Apple said it wasn’t unusual for devices with silicon bases to cause similar marks on wood. While this sounded like an excuse, it seems that the company's statement might have been pretty accurate. Several reviewers and Twitter users reported that the HomePod left circular marks on wooden surfaces with an oil or wax finish. According to Mike Prospero of Tom’s Guide, Apple’s device isn’t the only speaker with this issue. He found that the $200 Sonos One, which also has small silicone feet, left white marks on his cabinet. Prospero notes that these only seem to appear on wood that doesn’t have a finish coat, such as polyurethane. No marks appeared after the Sonos One had been placed on a pair of speakers with a clear coat. If you absolutely must position one of these speakers on top of some wood, the obvious answer is to use a coaster, or anything that stops them touching the surface. And if you’re a HomePod owner, there’s even a new $19.95 leather coaster from Pad & Quill designed specially for Apple’s device.